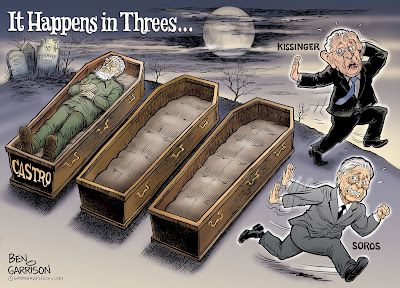 They say deaths of famous people happens in threes. I have some suggestions in this cartoon for the other two. A murdering, despicable tyrant named Fidel Castro is dead. 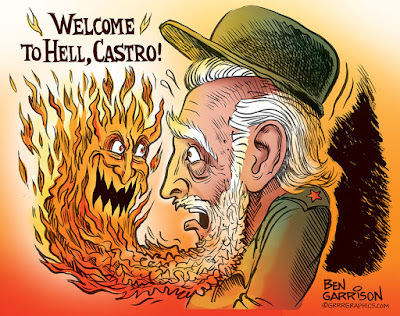 He inflicted communism on Cuba, which he and his brother ran with an iron fist. Castro lived to an overripe old age. Many dictators live long lives because they love power. Gollum in “The Lord of the Rings” couldn’t die as long as he possessed the Ring of Power. Even when he lost it he couldn’t die because he still lusted for the ring. It’s the same principle with tyrants. Some years ago I read a biography titled “Mao, The Unknown Story," written by Jung Chang. When Mao was finally about to die, he resented it mightily. Not necessarily because he feared death. What he really resented was losing his power. He absolutely loved it. He was obsessed with power. So was Castro. The globalist cabal includes old men such as Henry Kissinger, George Soros, David Rockefeller and many more. All these ancient creatures cling to life, power, influence and money. It’s as if they want to hang around long enough to see their globalist dreams come true. The war criminal known as Henry Kissinger is a notorious figure who pushes the New World Order. He has contempt for humanity—he considers most people to be 'useless eaters.' Rockefeller is over 100 years old and worth many billions of dollars. He’s had multiple heart transplants. He’s more a ghoul than a human being. He’s proud to be part of a secret cabal bent on dominating the world. Or it could be he knows he can’t take his many billions of dollars with him, so he’s decided to stay on Earth permanently. Soros persistently pumps money into strategies that bring strife and division to America. He thinks a broken America can be made to accept the new world order—with Soros being one of those in charge and administering it. Currently he’s busy funding those who want to challenge Trump’s legal election. What these people want is collectivism for humanity. It can also be called communism. They don’t really care what it’s called as long as humanity is united and enslaved under their whip. The cabal is getting more desperate which makes them more dangerous. They want to shut down free speech on the Internet. They know their propaganda arms known as the mainstream media are being held in contempt by most Americans. These monsters can’t live forever and people are waking up. Don’t rest in peace, Castro. You certainly don’t deserve it. "Today, the world marks the passing of a brutal dictator who oppressed his own people for nearly six decades," Trump said in a statement issued a couple of hours after his tweet. 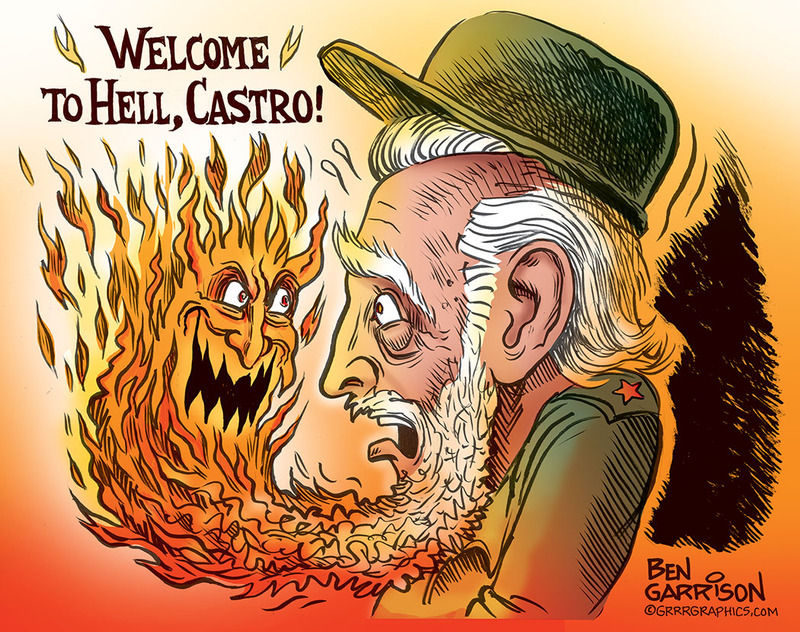 "Fidel Castro's legacy is one of firing squads, theft, unimaginable suffering, poverty and the denial of fundamental human rights. While Cuba remains a totalitarian island, it is my hope that today marks a move away from the horrors endured for too long, and toward a future in which the wonderful Cuban people finally live in the freedom they so richly deserve."